The immediate astrological future of India as of this present moment does not look bright, the future of India and Hinduism go hand in hand. Even though, it has been predicted and prophesied time and again that India and Hinduism will be the great shining light that guides the world into the next age, the one that come after the dark days of the Kali Yuga. However, these prophecies are still some way ahead in time; the immediate future of India will be turbulent and dramatic to say the least. 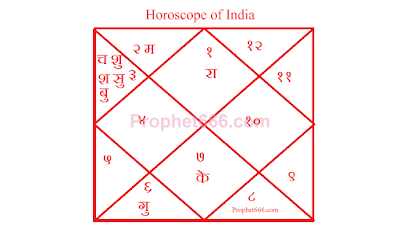 If one looks at the most acceptable Horoscope of India as on the Midnight of 15th August 1947, you will notice that all the major planets are positioned in between Rahu and Ketu in the first half of the Kundali and the second half of the Horoscope of India is blank. This could be possible indicative totally changed and diverse circumstance in the latter half of the future or life of India. 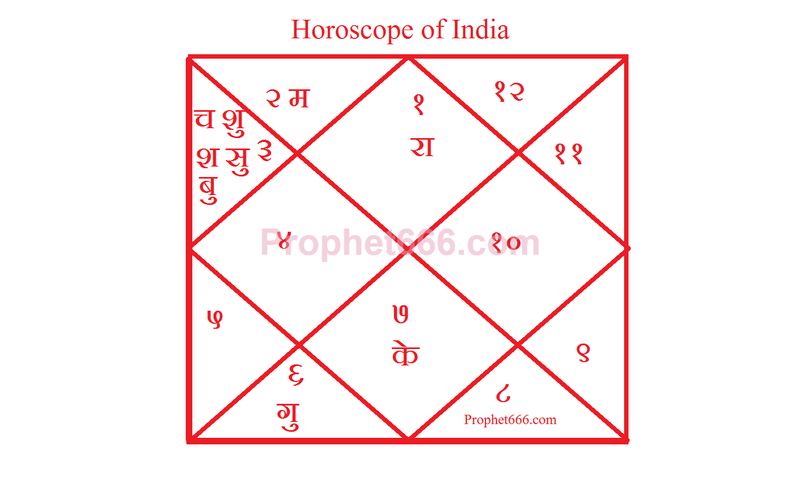 The astrological prediction that India as a nation cannot survive in its present state and form is based primarily upon my study of similar Horoscopes, which are indicative of drastic changes in the latter half of the life of an individual, the same is also true for regions and nations. The biggest challenge is the ever-increasing population of India, which is increasing in an uncontrolled manner that within just a few years it will overtake the population of China, a country, which is three times larger in area than India. This population growth will continue unabated and the available resources will not be able to meet the demands of this ever-increasing population. Another major challenge is the ongoing fight to hog the available resources among the various sections of Indian society based upon caste, region and regional combinations. This problem will rise alarmingly and will eventually lead to civil wars and the rise of warlord caste politicians. Apart from what is mentioned above there will also be other challenges like huge increase in crime rate, corruption and unemployment and other connected factors. As is the case in such circumstances, the laws of nature will intervene and there will be a great increase in natural disasters like floods and earthquakes and also wars, which will eventually control the unabated population growth. The war part is of course an offshoot of the much awaited and anticipated Third World War, which wipes out the major chunk of the world’s population. The great predictions and prophecies made about India will be fulfilled after the coming Third World War, which appear inevitable. India in its present form appears to be a failed state, which will be revived after the destruction of the Great War. Thanks for your predictions and details about our country. What is the prediction date of the Third World War? See the Third World War Section, the exact date is yet to be estimated, but it is most likely that the Third World War could erupt suddenly. Respected Sir, I am a patient of an incurable disease Ankylosing Spondylitis, and always in pain and this has ruined my life,please help. And leave the rest to God to do what is best for you. I am a bit confused with your predictions. Last one of the articles you said Modi would be the agent of change. Then this article you say that the change would not happen without third world war . How do you reconcile these statements?. the first statement means the change has started the second means it is still time to go. Third do you see indian people standing for themselves. the change has already started, Modi has been identified as the Agent of Change by this site much before he became the Prime Minister of India. The battle to hog National Resources is already underway - Demands for Caste Reservations by those who do not need them is one of the indications. The great predictions for India will certainly be fulfilled after the Great or Third World War by the Great Predictions, I mean a total change and that does not have anything to do with Modi. Sir my major concern with indians or place from where i come is that we people dont standup for ourselves it means that we are taking the things that are imposed on us by Kings then by British and now by our politicians. 1) Would we ever stand for ourselves,which means would we ever fight injustice. 2) Would we start reasoning/ rationalising what we are doing?. 3) Would we stop hungry for things that do not belong to us?. Since you talk about third world war would that be started by india. I also dont see Kejriwal doing any good to delhi dont take me as a Modi supporter . I see kejriwal is just trying to take the lime light. The future looks bleak on all the 4 points raised by you and it will continue to become more bleaker. The world war will not be started because of India, but India will play a major role in it. Modi has to take some tough political decisions and should not take the public mandate for granted. The astrology predictions for India. especially the Hindus of India look very bleak, it will be a Dharma-yuddha between Hindus and non-Hindus, which include the Secular Scum and the Muslims on one side and the followers of the Hindu Dharma on the other side. Hindu have always lost owing to the Jaichands presents everywhere, today these traitors thrive and anyone can kick and abuse the Hindu religion as they please. If you try to defend, you are dubbed as a right winger and fanatic. those who want to destroy and finish of the Hindu religion. If I remember it correct..it was Late PM Rajiv Gandhi who declared India as a 'Secular Nation'. Before Christians came..before Mughals brought Islam..before Buddha and Mahavira..before Guru Nanak Sahib and all the Dharam Gurus what was the religion in India? What name was given to the religion that existed during ancient vedic era..? Hinduism has no beginning, it is a the natural course of evolution. As Mahatma Gandhi said- Hinduism is like the Ganga pure at its source, gathers dirt and filth at it makes it ways through the plains and once again becomes pure as it merges into the ocean.